Making sure that your dog is contained within the perimeter of your home and kept away from the dangers of the outside world is one of the basic tenets of responsible pet ownership. When you purchase a wireless fence from Dog Guard, you make a real investment in your pet’s safety and security. Our underground systems are guaranteed to keep your dog safe and within the boundaries you specify. These are just a few of the benefits of installing an electric dog fence. Vermont dog owners can also establish respectful relationships between their pets and the lush landscapes of the state during the training process. When it comes to ease of use and unobtrusiveness, a wireless dog fence provides several advantages over the usual wooden or metal fences that surround a yard. Unlike traditional fences, our pet fence remains underground and out of sight. To the naked eye, it could appear that no perimeter exists at all, giving the illusion of open space. Cost remains one of the most popular benefits of an electric fence. VT residents can enjoy all the security advantages that a physical fence can provide their pets, but without the construction or maintenance, such as cleaning and repairing, that can be involved with physical fences’ upkeep. In this way, a hidden fence can save you time and money. Teaching your pet how to live and play around an electric dog fence is an easy and straightforward process, no matter the size or breed of your dog. When you call us to make an appointment and we arrive at your home, we’ll assess your yard and your dog’s personality. It’s then that we’ll create a training process plan and time line that fits your needs and the quirks of your pup. Generally, training begins the moment we plant flags around your house’s perimeter to denote the boundaries of the hidden fence. VT dogs respond well to these very visual signposts: they’ll help pets understand that certain areas are different from others. For about two or three days, we suggest that you walk your dog on a leash around the perimeter. During this time frame, we’ll have your dog’s receiver on its collar set to sound a warning tone when it accesses an out-of-bounds area. When it walks too close to the fence and the tone becomes audible, you should verbally correct your dog and offer encouragement when it returns to the safe side of the electric fence. Vermont dog owners typically continue on this course for about three days. Once your pet seems to have mastered tone correction, we’ll set your dog’s collar to emanate a mild electric shock for the next phase of training. You’ll be expected to walk your dog on a leash around the boundaries again, but when your dog crosses them, it will feel an electric correction instead of hearing a tone. It’s important to reward a retreat into the safe zone with high praise, as your pet will need to know, on no uncertain terms, that the area beyond the fence is off-limits for it. After mastery of the previous level of training, we’ll then proceed to off-leash proofing sessions. These sessions consist of allowing your dog to stroll at its leisure around an electric fence. VT Dog Guard professionals will then make a bid for your pet’s attention by tempting it from the out-of-bounds area with items or people. If your dog recognizes the temptation but refuses to give in to it, training will be considered effective. The entirety of the training process should take no more than two weeks, but we’ll work with you to create a protracted or highly customized plan if your dog seems to be a little resistant to the system. 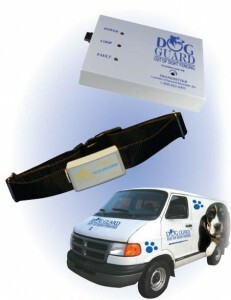 At Dog Guard, your satisfaction after you buy one of our products is our highest priority. We’re so confident that you’ll love our products that we offer a money-back guarantee if you’re not completely happy with your purchase. In addition, our lifetime warranties allow you to receive free replacements for any equipment that becomes damaged while you use it. Contact us at 1-800-865-0495 to get a free quote. Ask about our special dog fence trade-up program for a possible discount on your new system.